These buildings were razed in January, 2006. The Donovan Building was designed by Albert Kahn and opened in 1923. Commercial shops occupied the street level while the offices in the higher ten floors were rented to various businesses. The building, however, is best remembered for its link to Motown Music. Barry Gordy borrowed capital from his family and founded his Motown music firm in the converted home that is now recognized as the Hitsville Motown Museum on West Grand Boulevard. As his business prospered, he turned Motown Records into a production line industry. Eventually he purchased at least a dozen of the large homes that faced West Grand Boulevard to serve as offices and production suites for his booming business. By 1968, Motown Music was cramped in the various homes they occupied, so Barry Gordy purchased the Donovan Building at Woodward and I-75 for their home offices. By this time, Motown Music has become the world’s largest black-owned and operated corporation. Apparently, many of the artists who created the wealth for Motown found the Donovan Building too professional and bureaucratic. It lacked soul. They preferred the informality of the many homes along West Grand. After moving his offices to the Donovan Building, Barry Gordy held many of his most important meetings at the Ponchatrain Hotel on West Jefferson rather than at the Donovan Building, further separating himself from the artists who helped create his wealth. In 1972, Barry Gordy moved his Motown business to Hollywood seeking greater financial success by locating in the entertainment center of the world. He also hoped to shift from the production of music into the production of films. He more or less moved to Los Angeles under cover of darkness since he told few of his artists or colleagues about his intentions to the leave the Motor City. Needless to say, many Detroit African Americans admired Barry Gordy since he succeeded at rivaling whites in capitalist entrepreneurship but they felt a great loss when Gordy spurned Detroit for the presumably greater riches of California. Many of the artists who were not invited to come to Hollywood may still bear animus toward Barry Gordy. To some, it appeared that Barry Gordy amassed a great fortune working with Motown talent and then, at the peak of his business, he stealthfully departed for Tinsel Town. In many ways, Motown Industries best years were behind them when Gordy moved his business. He hoped to move into movies but produced, I believe, only one highly successfully film—The Lady Sings the Blues. Tastes in music also changed and by the 1970s, the Motown sound lost some of its popularity. In the 1990s, Gordy sold his interests in Motown Industries and the firm passed through several international conglomerates. This building at 2457 Woodward was owned for many years by one of the international firms that purchased the successor firms of Motown Industries. The building is located very close to Detroit’s prosperous downtown entertainment districts—The Fox Theater, Comerica Park, Ford Field and the Gem Theater. On January 6, 2003, the owners of the former Detroit headquarters of Motown Music announced a $28 million redevelopment of the structure. The lower floors would be remodeled to create a large museum of Motown Music, honoring its stars, its entrepreneurs and its sounds. 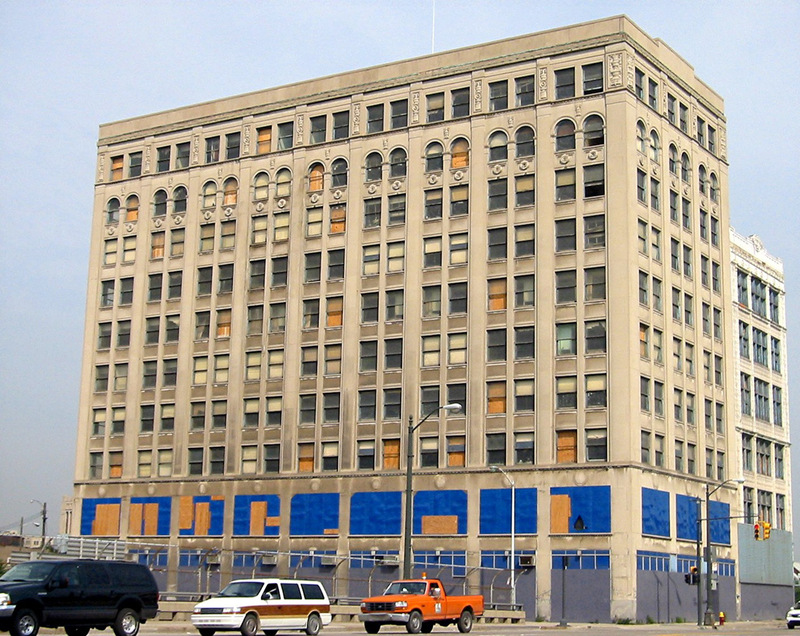 The upper floors of the Donovan Building would be converted into attractive apartments or condos appealing to the young people who worked nearby in downtown Detroit. This plan was never implemented and the building stood idle. The Super Bowl was played in Detroit in February, 2006. In January of that year, Mayor Kwame Kilpatrick termed the Donovan Building an eyesoar and asked for its removal prior to the football game. The building was then owned by the Cherrylawn Realty firm. They agreed to raze the building and, within a two week period in January, 2006, the buildings were disappeared. The building adjoining the Donovan Building in the picture shown about is the Sanders Building. I do not know who designed that seven story building or when it was constructed but I suspect it went up in the 1920s. It was, I believe, originally known as the Fred Sanders Henry Street Chocolate Factory. Sanders produced ice cream and candy. Indeed, the street level commercial shop in this structure was a popular ice cream spot. These building went down very rapidly in January, 2006 so little was saved. However, there was an attractive tesselation above the entry to the Sanders Ice Cream Palor. It was in disrepair by 2006 but the Detroit Institute of Arts was able to remove and retain that moasiac. The razed structure was not the only Sanders Building on Woodward in downtown Detroit. Previously, the Sanders firm built an eight-story structure at 1525 Woodward next to the Grinnell Brothers Music Building. Both of those buildings remain but they are not currently shown on this website. For a few hours on the afternoon of Sunday February 2, 2006; the land where the Donovan and Sanders Buildings stood was used a parking lot for spectators who watched the Pittsburgh Steelers defeat the Seattle Seahawks 21 to 10.